This gift set is comprised of an exciting sleek, tan faux leather stainless-steel beverage flask, handsome corkscrew/bottle-opener, and a natural wooden keepsake box. 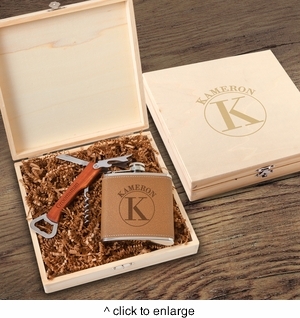 An exceptional groomsman gift set or best man’s gift set. Details:6 oz. Flask wrapped color is tan; personalization color is brown Bottle opener includes fold out corkscrew and fold out knife Personalized wooden box measures 8 3/8" x 8 1/8" x 1 7/8"